Almost wordless: A sure sign that spring has arrived. Lots of robins in the park last Saturday. I really and truly honestly think I would like to start some bird watching. Maybe that could be a project for the future. Bird watching can get addictive. I started by putting up some feeders and watching birds in the backyard and now I’m a member of the local bird club, go on organized bird walks, and I monitor birds for the forest preserve. The birds around here have been very active. I think we’re going to see some babies soon. We have a lot of Robbins, and the Cardinals have been very vocal for the past few mornings. Spring! A beautiful harbinger of Spring! Yay for spring! 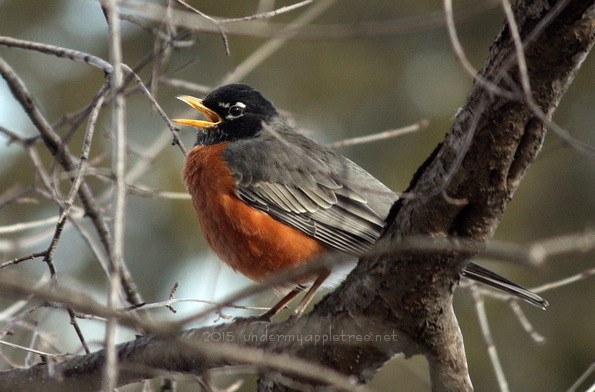 Of course, w have a few robins here all year long. I think it might be on the edge of their winter area. We have some year-round too, but mostly in flocks that move around in the woods. The ones I saw were foraging individually. Every morning I am greeted by happy chirps and whistles. LOVE IT! Beautiful sign of spring, well shot! There’s lots of chirping going on too… and the Cardinals have been singing. So nice to hear! I am easily excited by spring migration!